It’s been two years in the making, but Small is Beautiful: A Tiny House Documentary is finally here! We were very fortunate to pre-screen the film and also to view it with a large crowd at the Tiny House Conference last weekend in Portland. Anjali and I both LOVED it! You can read our review here. What was it like to make the movie? “I thought I’d make the film as a way to research tiny houses for myself so I could build one. I thought I’d be done in 3 months, and just pop up a video on my website. Now nearly two years later, I’ve spent all of my savings, had dozens and dozens of people help make the film and it’s become so much more than I could have every hoped for! 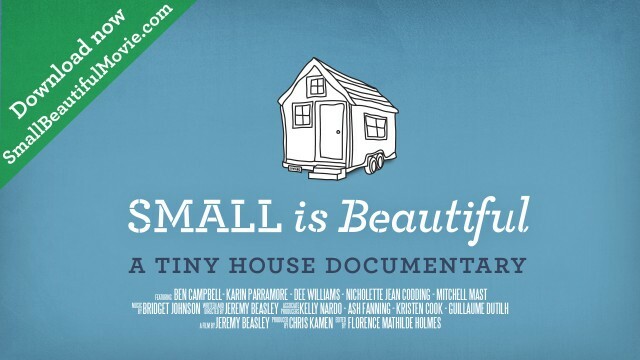 Small is Beautiful is also available on iTunes, Vimeo on Demand, Amazon Instant and Google Play. The Super Mega Awesome Deluxe edition has over 230 mins of video (that’s nearly 4 hours!) and it includes all the never before seen interviews and footage. There’s SO much good stuff in there. All the bits we love, but didn’t fit the story we wanted to tell in the film. I don’t burn my poop because I have heard bad stories about incineration toilets, it may not be all that hygienic, and I don’t know of any product made that is designed to use poop and an energy source. I guess it could be done, but I only a very small amount of energy could be produced. Composting poop is also reusing or recreating the energy, by returning the valuable nutrients to the earth to increase soil health and crop production. It’s all energy from the sun, an can be reused in many ways. Rain barrels are a great idea. Once my house is parked a more permanent location, I plan to add solar panels, rainwater collection and other features to make it closer to off-grid and more self-sustaining.